Georgia will be one of the top teams in college football next season. 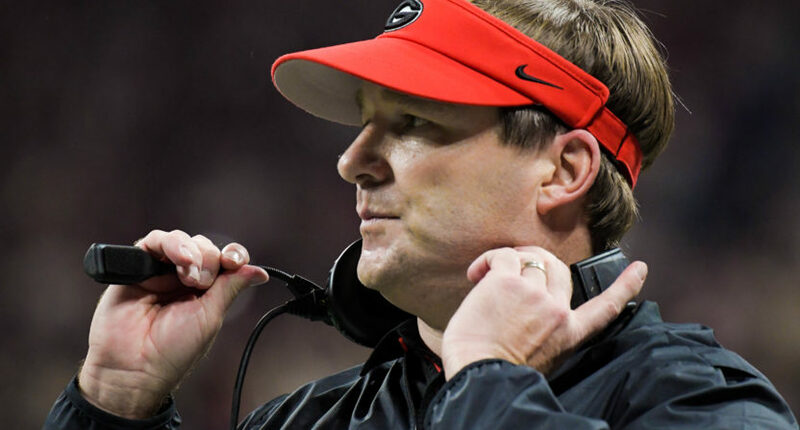 The confetti dropping from the leaky roof of Mercedes Benz Stadium in Atlanta may have been falling on Alabama players celebrating yet another national championship, but Georgia head coach Kirby Smart will head into 2018 knowing just how close the Bulldogs are to winning it all. As it turns out, Georgia is just one play away. In his second season as head coach of the Bulldogs, Smart has reshaped the Georgia program and was able to get it over one hurdle his predecessor, Mark Richt, could not. It certainly does not ease the pain of blowing a 20-7 lead in the second half. Losing to Alabama on the final play of overtime, a deep touchdown pass from a freshman quarterback immediately after getting a massive 16-yard sack, could sting for a while. But Georgia is in a terrific position to compete for a national title for an extended period of time. This was no flash in the pan in Athens. The Bulldogs are about to be a regular championship contender with Smart as the head coach. “Georgia is going to be a force to be reckoned with,” a slightly emotional Smart said in his postgame press conference. The 2017 season ends without a national championship for Georgia, but the strides forward as a program are not to be forgotten. In just two years in Athens, Smart managed to win an SEC title and get Georgia into the College Football Playoff. The otherwise wildly successful run by Richt netted zero appearances in the BCS Championship Game despite having a handful of teams worthy of making a run during the SEC’s streak of BCS dominance. It’s not that Richt was a bad coach — far from it — but Smart brought a fresh approach to the program and brought with him lessons learned from years as Saban’s assistant. And considering Saban has built college football’s gold standard, Smart was likely to bring a new winning edge to a Georgia program ready to try something new. Smart walked off the field with his arm over the shoulder of running back Sony Michel, waving his visor to Georgia fans chanting “U-G-A” in appreciation for a valiant effort and a memorable season. Georgia went toe-to-toe against the best college football program of the modern age, and Smart came the closest to being the first former Saban assistant to knock off his mentor. Georgia was one play away, or maybe two, from winning its first national championship since 1980. Smart on the field for the last time this season was a fitting image, because the coach was quick to establish a connection with his players upon his arrival in Athens, and they have been through a lot of growing during the past two seasons. So, what’s next for Georgia? The way-too-early top 25 posts are already out in full force and suggesting Georgia will be one of the top teams in college football next season. That is fair to say, even though Georgia will be losing some key players from their roster this season. The running game alone will lose Nick Chubb and Sony Michel, but freshman D’Andre Swift and Elijah Holyfield (the son of Evander Holyfield) will be a more than adequate running duo. The quarterback position will be in good hands with Jake Fromm, but the nation’s top-ranked recruit is an early enrollee at Georgia. Justin Fields will get a chance at some reps this spring. The Bulldogs defense will lose Roquan Smith and a handful of players in the secondary. But Smart’s expertise is defense, so you can bet Georgia will work out their mild concerns on the defensive side of the football. Georgia has always been a bit of a sleeping giant since their last national title run. In 2017, the giant was awakened. In 2018, we’ll see if the giant is ready to climb back to the top of the college football world. It may not work out in 2018, but Smart is right in suggesting his program is not going anywhere. Georgia is in position to be a regular contender, and a national championship could be coming into view on the horizon.